Earlier this week, it was widely reported that Disney and Lucasfilm were meeting to discuss the possibility of bringing Princess Leia back for future films by digitally recreating Carrie Fisher for a CG performance, much the same way they brought back her 19-year-old self for the cameo in Rogue One. Meetings were held on January 10. And today we have an answer about their decision. Here is the official statement from StarWars.com. "We don't normally respond to fan or press speculation, but there is a rumor circulating that we would like to address. We want to assure our fans that Lucasfilm has no plans to digitally recreate Carrie Fisher's performance as Princess or General Leia Organa." The statement doesn't go onto say what was discussed in terms of Leia continuing on in the Star Wars universe. Or how her absence will be addressed in Star Wars: Episode IX. It has been confirmed that all of Carrie Fisher's scenes were shot for Star Wars: Episode VIII. The official Disney PR goes onto say this. 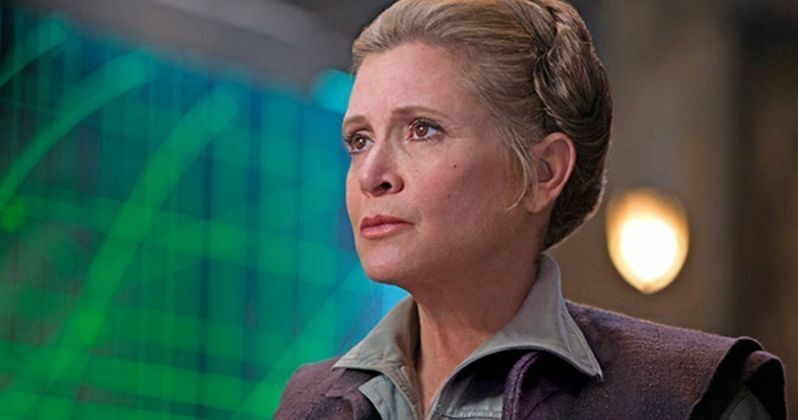 Shortly after Carrie Fisher's death, it was reported that Star Wars 9 director Colin Trevorrow was meeting with Lucasfilm and Disney about a massive Star Wars 9 rewrite, which could also affect Star Wars 8 moving forward. Leia is said to have a bigger role in Episode 8, which was supposed to expand in Star Wars 9. The story has to be rewritten now to account for Fisher's untimely passing. There are two key scenes for General Leia Organa that are spread between Star Wars 8 and Star Wars 9. The first of which features a reunion between Leia and her twin brother Luke Skywalker. This scene, or at least part of it, was already shot. The second key scene involves Leia coming face to face with Kylo Ren. It has been reported that some or all of Leia's scenes may be cut from Star Wars 8 so that the story can continue in Star Wars 9, a problem that has not been discussed in any official capacity by Disney or Lucasfilm. There is heavily speculation that the reunion between Luke and Leia comes in the final moments of Star Wars 8, with that being the final scene. If that is the case, this moment may be excised from the movie for the simple fact that they won't be able to continue it in the next chapter. At this time, no one is certain how this will affect Star Wars 8, which is hitting theaters in December. Substantial reshoots are likely to happen in the very near future.